Dr. Mohebi and the US Hair Restoration now have the pleasure of having a hair transplant office in the San Diego, California. 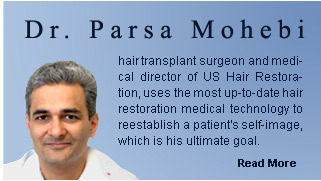 Using superior, up-to-date techniques for hair restoration surgery, Dr. Mohebi and his staff place great emphasis on quality and patient satisfaction. He is effective and always working to maintain his credibility as a hair transplant surgeon in the San Diego hair restoration consultation office and other offices of US Hair Restoration. Quality and affordable hair transplant costs are what our hair transplant surgeon Dr. Mohebi and the US Hair Restoration aim for. Using state-of-the-art procedures and a friendly attitude, the US Hair Restoration has become a highly favored hair clinic for San Diego Residents as well as those living in La Jolla, Del Mar, Rancho Santa Fe, Carmel Valley, and Oceanside County.